Crystal habit is prismatic and may be 3, 6 or 9-sided; often a triangular prism with convex faces, and often long and heavily striated parallel to the c axis. Pyramidal terminations are common. Misnomers: Brazilian sapphire-blue tourmaline; Brazilian emerald, Ceylonese peridot-green tourmaline. Achroite: colorlessBi-color or parti-colored: tourmaline with two colors and multiple colors. Chrome tourmaline: fine intense green usually colored by chrome or vanadium. Dravite: yellow or brown tourmaline. Elbaite: a sodium lithium aluminum tourmaline species. Fluor-buergerite: bronzish-brown to dark-brown to almost black with bronze schiller. Indicolite or indigolite: violetish blue to greenish blue. Liddicoatite: a calcium lithium tourmaline species. Povondtaite: dark brown, brownish black to black with resinous luster. Paraba tourmaline: a neon blue to green colored cuprian Elbaite tourmaline originally found in the Brazilian State of Paraiba. Rubellite: deep pink to red stones. Schorl: black, brownish black or blueish black stones. Uvite: a calcium magnesium aluminum tourmaline species. Verdelite: dark green,yellowish green, brownish green to blueish green. Watermelon: pink center with green edges. Birefringence is typically around 0.020 but dark material can be up to 0.040 October birthstone. Pyroelectric: development of opposite charges at the ends of a tourmaline crystal due to change in temperature. Piezoelectric: development of opposite charges at the ends of a tourmaline crystal when placed under stress. Green tourmaline is a type I clarity stone. 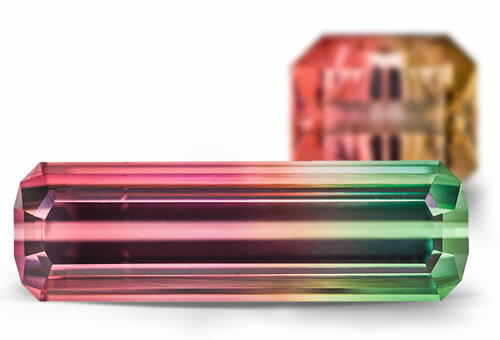 Blue, purple, red, orange, yellow and bi-color or parti-colored tourmaline is a type II clarity stone. Red and watermelon tourmaline are type III clarity stones. Tourmaline might contain tube-like 2-phase inclusions running parallel to crystal's principle axis, film-like, irregular or long and thin liquid inclusions, angular thin reflective inclusions, gas inclusions in net-like pattern, parallel oriented hollow tubes, needles.